The assault and attempted robbery happened over the weekend, police say. It ended after a vehicle pursuit and brief foot chase. CHARLOTTE, N.C. — Two people have been arrested for their involvement in an attempted robbery over the weekend. 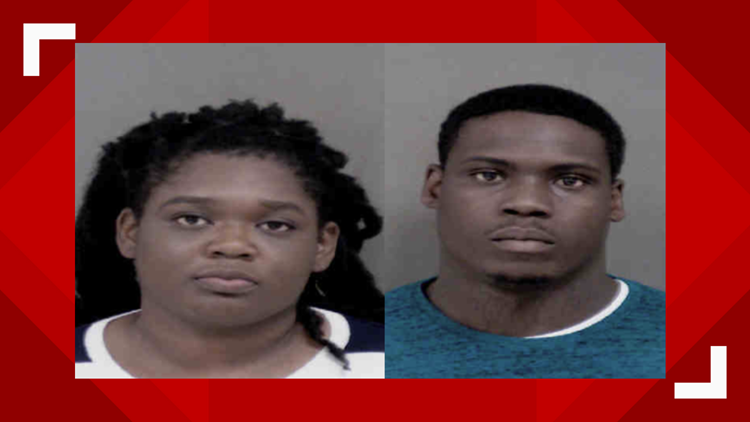 The Charlotte-Mecklenburg Police Department has arrested 26-year-old Javon Partae Turner and 22-year-old Roderia Kelly. On February 10, around 12:10 a.m., officers in the South Division responded near the 10200 block of Old Ardrey Kell Road to a disturbance call for service. When officials arrived, they found the victim injured from an altercation. The victim told police she had arranged to meet Turner and Kelly for a business exchange, but the agreement was not met and the deal was terminated. At the conclusion of the terminated exchange, officials say Turner asked to use her phone. When the victim refused to allow Turner to do so, Turner attempted to take the phone from her and assaulted her by striking her in the head. Turner brandished a knife and demanded the victim’s phone and money, officials say. Kelly and Turner left Old Ardrey Kell Road in a white BMW sedan, according to CMPD. Officers located the BMW nearby and attempted to make a traffic stop on the vehicle; but the driver failed to stop, leading to a vehicle pursuit. South Division officers and the Aviation Unit pursued the BMW until it came to a stop near Arrowood Road and I-77. Police say Turner fled on foot from the vehicle and was apprehended after a brief foot chase. Kelly, the operator of the BMW, was also apprehended. Kelly was transported and interviewed by a detective, after which she was transferred to custody of the Mecklenburg County Sheriff's Office and charged with no operator’s license, displaying an expired registration number plate, and operating a motor vehicle while fleeing to elude a law enforcement officer. Turner was interviewed by a detective and transferred to custody of the Mecklenburg County Sheriff's Office, then charged with attempted robbery with a dangerous weapon, assault on a female, and resist/delay/obstruct a law enforcement officer.